Today marks the tenth anniversary of the late Steve Jobs unveiling the MacBook Air, the world's thinnest notebook at the time. After introducing the AirPort Time Capsule and sharing some iPhone and Apple TV news, Jobs walked over to his podium, grabbed a manilla envelope, and pulled out the sleek MacBook Air. The crowd at Macworld erupted with applause as Jobs held the ultra-light notebook in the palm of his hand. The thinness came at a cost. The base model ran $1,799 for a 1.6GHz Intel Core 2 Duo processor, 2GB of RAM, and an 80GB hard drive. A maxed out version was also available for $3,098, around $300 more than the base Mac Pro at the time, with a faster 1.8GHz processor and a 64GB solid-state drive. 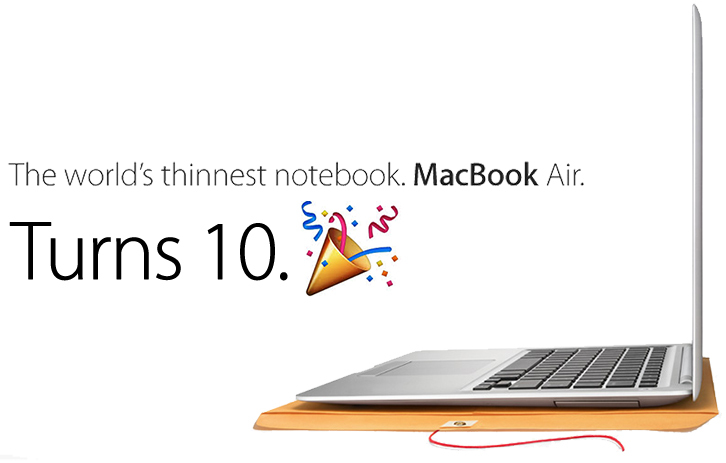 MacBook Air was all about firsts. The notebook was Apple's first without a CD/DVD drive, first to ditch a range of ports and connectivity options, first with a multi-touch trackpad, first to have the option for SSD storage, first to weigh just three pounds or less, and first with a mercury-free display. A single design decision also epitomized the past decade of Apple: a flip-down door on the right side of the machine provided access to only a single USB port, a headphone jack, and a micro-DVI port. We've seen Apple go down this path many times since: it introduced the MacBook with just a single USB-C port, reduced the MacBook Pro's connectivity to Thunderbolt 3 ports, and removed the headphone jack on the iPhone 7. Each change generated controversy, but ultimately set the course for its future. Stephen Hackett of 512 Pixels has shared a great piece titled The MacBook Air: A Decade's Worth of Legacy over at MacStories that dives into the notebook's history. He also put together the video below. A decade later, the MacBook Air remains a product in Apple's lineup, but likely only because it is a lower-cost option. Beyond a minor speed bump last June, the notebook hasn't been updated since March 2015, and it very well may be discontinued once Apple feels able to sell its 12-inch MacBook for around $999. "The thinness came at a cost." Like the crippled MacBook Pros of today? Apple should really refresh the Air. This was a game-changer. Never before had the tech world had so much power and utility in such a thin device. Netbooks were an attempt at this, but ultimately failed because they were singe-use devices. The Air set the stage for developments that would forge laptops beyond. Stop reminding me how old I am! Well since this year will be the 10th anniversary they'll be introducing an Air X. Despite his antics in the workplace, he will always be missed. Wow, has it been that long. I will say it was a defining moment in computing, one of which we still feel the reverbarations today. AFAIR it was also the first with a unibody-style construction. They did. It's called the MacBook. The first gen MBA was woefully underpowered and massively overpriced. However what it did offer was a vision for the future of portable computers and it was very desirable. That's always been the case with new Apple products I find. My mid-2013 13" i7 1.7Ghz 8GB RAM is hands down the best Mac I have ever owned ... and I've had iMacs, Mac Minis, PowerBooks, and MacBook Pros. It is super light, portable, performant beyond expectations, still has great battery life, boots in about 6 seconds (only occasional reboot anyway), and runs on the latest OS. It really is the best investment I ever made.